Jackson over the years has been one of the strongest programs in southeast Missouri for decades. Quietly around the rest of the state might not fully comprehend what they have done on both the boy's and girl's side in the sport of track and field. Secretly I always root for Jackson to do well because most of my family is from neighboring Bollinger country. Which, also makes me a fan of Woodland too. A lot of relatives and friends have built their life down there helping kids learn life lessons through sports. The coaches at Jackson are kind, hardworking, and humble to a fault. 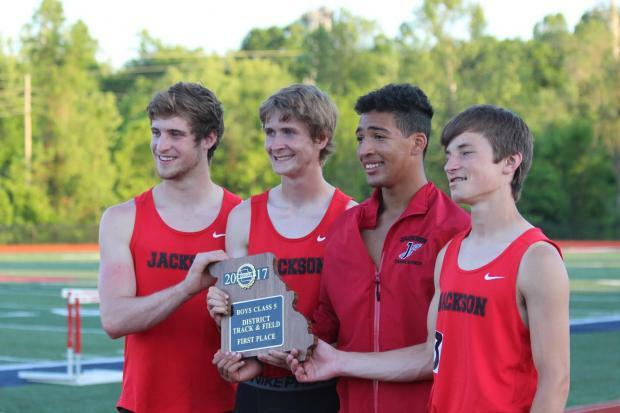 This years boy's team once again did their job in keeping the Jackson tradition alive winning another district title over another southeast Missouri powerhouse Poplar Bluff. Mo.milesplit: Coach what was the most satisfying part of your win? Coach Stoverink: It was how hard our kids competed. I was really proud of how a few of our kids have had to handle adversity to contribute here at the end of the season. In addition, we got some extra points from kids that really stepped up and outperformed expectations. We had multiple athletes that placed in the 4th-6th place range that were seeded 8th-13th. To be honest...not really. Poplar Bluff just beat us the week before at our conference meet pretty handily. They are a very talented and well-coached team. I fully expect they will come back with a vengeance the next two weeks. Mostly that it has really been a truly balanced team effort this year. I can't really identify anyone who has stood out above the rest. Just a lot of kids that are willing to grind it out to perform as well as they can. What has made it special too for the coaching staff is that we have a really good group of kids. They aren't just good athletes, but they are good people that are coachable and fun to work with. What was you meet highlight? I'm sorry, but I can't pick just one. For me there were three performances that really stood out. 1) Our freshman hurdler getting 6th in the 110's and 4th in the 300's 2) Our senior triple jumper eclipsing his previous PR by two feet to score us some very unexpected points. 3) When it got down to the 3200 we were down by 7 pts., and we knew that we had to score at least 3 pts. to even have a chance to tie for the team title, and we had to have 4 pts. to have a chance to win. Our two guys were seeded 7th and 8th, and ran very gutsy races to finish 6th and 8th giving our 4x400 team a chance to bring it home, which they did.me there were three performances that really stood out. 1) Our freshman hurdler getting 6th in the 110's and 4th in the 300's 2) Our senior triple jumper eclipsing his previous PR by two feet to score us some very unexpected points. 3) When it got down to the 3200 we were down by 7 pts., and we knew that we had to score at least 3 pts. to even have a chance to tie for the team title, and we had to have 4 pts. to have a chance to win. Our two guys were seeded 7th and 8th, and ran very gutsy races to finish 6th and 8th giving our 4x400 team a chance to bring it home, which they did. To leave it all out on the track, in the rings, and on the runways next week at Sectionals. To compete hard, survive, and advance. Like I tell our athletes all season though, the most important goal is to have fun and enjoy the experience. As another coach has already said..." state is so hard to predict." The only thing that I AM sure of is that the competition will be at a very high level. Before thinking about State though we have to focus on Sectionals. Class 5 Section 1 just always seems to be loaded with talent. Nobody on our team has an easy road to State. We have a few kids that have a good shot to get on the podium if they compete well. We also have several young kids for whom just qualifying would be a nice accomplishment, and for them if they can get there the State Championships can be a great learning experience.